Outside, in front of the farm-house is the baking oven, inside, in the main living-room the tiled basic heating oven. Many connect this image with old time farm-life in Central-Europe. 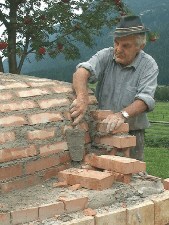 New ovens are still being build though in certain areas of Germany where master oven-builders carry out their trade. An oven-builder knows what matters in making an oven draw well, how to prevent it from developing cracks over time and how to design an oven so that its efficiency exceeds that of a modern oil heating system by far. Some of the techniques seem very simple. Others, like the erection of the vaulted ceiling for the baking oven, appear outright exotic. 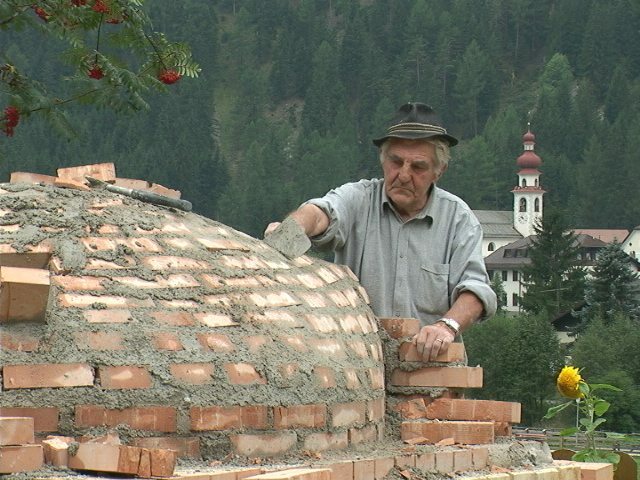 Josef Niederkofler from the Ahr valley in Germany has been building ovens over tens of years. He is building a baking oven and a basic heating oven, one last time. LINK weglassen, die englischsprachige Kundschaft wird keinen Ofenbauer aus Niederbayern kommen lassen.